Ayodhya was in news, for all the wrong reasons, again. Vishwa Hindu Parishad, that venomous organization with equal hatred for the minorities and the nation, had tried to infiltrate into Ayodhya yet again. They were stopped by the state government. It was a game well played. A communal organization has attempted to gain some of the lost grounds by undertaking a Parikrama that is not allowed in these inauspicious times of Chaumasa (the rainy season, to sit down and reflect) as per the Hindu calendar. In stopping the yatra, the state government, on its part, had pulled out the cosmetic move well that it badly needed to hide its rabidly communal character evident by its handling of riots against the minorities. They had played it at the cost of Ayodhya and all that it had stood for centuries. Ayodhya, thanks to them, remains no more a quaint mofussil Kasbah on the bank of river Sarayu. It is also the name of a fear, the mere mention of which sends shivers down the spine of minorities. No, not only the minorities in India. Ayodhya scares minorities across South Asia, be they Muslims in India or Hindus in Pakistan and Bangladesh. Something untoward happens here and the poor Hindus of Bangladesh are made to pay for that with their life and property. A centuries old building is torn down here by fanatic Hindu mobs and a thousand temples are razed in Pakistan by equally fanatic Muslim mobs. But then, was Ayodhya always a reservoir of sectarian hatred from where originated the streams of violence that burnt down everything that came in their way? Was it always the fountainhead of communal violence? It was not. It still is not, perhaps. How do I know it? I know this because I come from here. Okay, not exactly Ayodhya but a village that lies 28 kilometers to theeast of it. I know it because it has always been a part of my growing up. I know it because my father did not merely do his schooling here but also went on to become the President of the student union of the Kamta Prasad Sundar Lal Saket Post-Graduate degree college, the then only post graduate college in town. I know because it was always there in my life when I went to my university or came back from there. I know it because it was there, when I used to go to visit my maternal grandmother and aunts and then come back as they all lived on the other side of the river. I know because I have lived with my relatives in Ayodhya a hundred times. I know it because it was always there in the talks of my parents, my friends and all others I knew. That Ayodhya is the Ayodhya, one which is very different from this Ayodhya of the Rashtriya Swayamsevak Sangh clan. That one was a town known for its temples and Parikramas, or journeys of faith. That one was an idea that lived far beyond its boundaries. It did not chant Jai Shri Ram. It was the Ayodhya where Ram Ram was the general salutation which even Ramjan uncle of my village used without ever thinking twice. This was a place where all the Ramnamis (scarves with Ram written over them) meant for offering to Hindu gods were made by Muslims. It was the place where Muslims made all the khandau (wooden slippers) necessary for performing religious rituals. 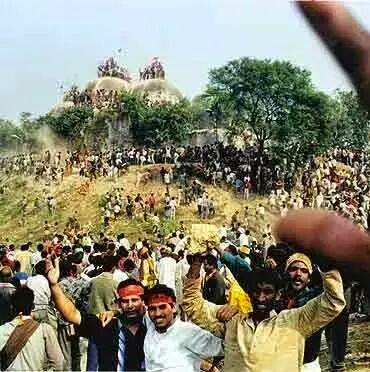 This was an Ayodhya where not a single riot took place despite all the venomous attempts of the RSS clan. In fact, Ayodhya remains the same in that much at least, as not a single riot has taken place here barring one by the outsiders, read fanatic Karsewaks. Coming back to Ayodhya, this was the one I grew up with; at least until the RSS clan came into the picture. It was the hinge upon which the life of the people in Eastern Uttar Pradesh rested. It gave them their joys and their sorrows. Its Parikramas gave the people the opportunities of running out of their mundane lives, often the only opportunities they ever had. This Ayodhya reminds me of my grandfather who kept inventing excuses to visit Ayodhya. This Ayodhya reminds me of all those sad evenings when people took the dead bodies of their near and dear ones to be cremated at the Ghats of Ayodhya. This was the town with which I could never break off emotionally and culturally despite having turned into an almost fundamentalist atheist by then. And then, it all started changing. The RSS clan had started spreading it venomous fangs with its Ram Janmbhoomi ‘movement’. Unfortunately, for the nation, they found a silent supporter in the then invincible Congress, the self designated custodian of secularism in India. They started with a campaign for unlocking the temple. Congress allowed it. Having drawn the first blood, they started a Shilapujan (worshipping the bricks to be used to build the Ram Temple) campaign. The Congress allowed that too. I still have the frightening memories of that Shilapujan thing, perhaps the first yatra of faith that insulted faith itself. I remember, with horror, the trucks that came amidst chants of anti Muslim slogans. Communal relationships had started to change. Distrust had begun to seep in. Age old friends had started getting uncomfortable. The jinni of hatred was out of the bottle. The RSS clan had successfully changed the image of a peaceful, profound Ram going to jungle with Sita and Lakshman into one with a raised bow ready to raid the towns. We all know what happened after that. L. K. Advani, unbelievably turned into a secular leader now by his power hungry cronies, had gone on a Rathyatra that left a trail of blood behind. He had divided the country again. It was the return of the partition but for the number of those the mayhem killed. Babri Mosque was razed to ground and the criminals responsible for this were in power in Uttar Pradesh instead of being in jail for their crime. Bhartiya Janata Party, the political arm of the clan, was on its way to power in Delhi. Once in power, they happily forgot both Ayodhya and Ram. That was a telling comment on real character of the RSS clan. They were never fighting for Lord Ram or his temple and they knew it. They had, in fact, turned the faith into a begging bowl for votes. They had turned the Parikramas into poll planks. They had turned Ayodhya, a town we love, into a living hell. This is just that they had done all this with a little less insult to Hinduism that they claim to be the champion of, than this time around. They had stuck to rituals and beliefs of the religion a vast majority of the country adheres to. They had turned the tradition on its head for polarizing the people for electoral gains. How do I know it? Because Makhauda is very close to my village and I have seen the yatra year after year. This is why I know that the assault, now, is on Hinduism itself. I, like many others, had stood against when it was against Islam. It is the turn of those who did not then and thus let these buggers get so emboldened to speak up. It is the time for all the faithful to save their religion from its self-appointed custodians. They would insult it even more for their petty interests if you don’t. And yes, don’t believe that the state government is going to stop this communal charge. They are playing this game together. Polarisation will help the state as much as them in the upcoming Lok Sabha elections. This is high time to tell them that faith is not sellable for electoral gains. Be prepared, otherwise, for another round of mayhem. I know that an atheist calling upon the faithful to save their religion is absurd. It is, though, much less absurd than the insults VHP has thrown the way of the faithful. And then, I would not mind being a little absurd if I can get my Ayodhya back from the clutches of these murderers. such a contentious topic and no comments?! you one line sums it all up "an atheist calling upon the faithful to save their religion is absurd!" i suppose we live in a nation where it is "Naam ke vasthe Ram naam"